Draped Bust Dime value is mostly determined by the mintage and how many survived of each date. 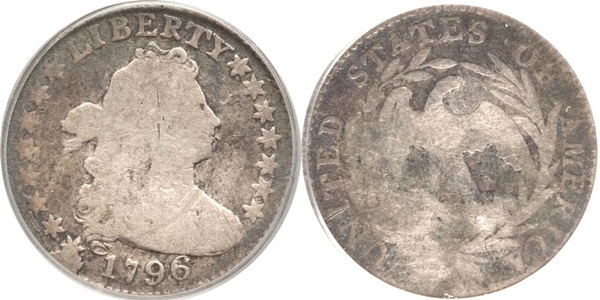 Draped Dimes are rare no matter the date and the most common date is 1807 and that date’s value begins at $426. The rarest dates is 1804 with 13 Stars and the value for this date begins at approximately $5,000. There’s two types of Draped Bust Dimes, Small Eagle and Heraldic Eagle reverses and the Small Eagle and this type spans 1796 through 1797. All values for the 1796 and 1797 dates is approximately $2,000 or more in the lowest grade found. The key dates are extremely rare and valuable and here’s a list of the most rare: 1804 13 Stars, 1804 14 Stars, 1796, 1797 and 1802. To realize the higher values the coin will need to be certified and authenticated by a reputable, third party grading service. Also lowest grade is AG3 (About Good) and G4 (Good). With the age of the Draped Bust Dime most examples known or found are in low grades of AG3, G4 and VG8 (Very Good) and often these coins are cleaned, holed, scratched or damaged in some way. So value is going to depend on the condition and grade and not what you read in a price guide. Draped bust Dime value in F12 (Fine) rise dramatically compared to the lower grades. For example, an 1802 is worth around $1,400 in G4 but in F12 the value increases to $3,050 and this trend continues up through all the grades and with all dates. In MS (Mint State) the 1804 is worth over $100,000 and the most common date, 1807, is worth $4,000 with all other dates somewhere in between but much lower that the 1804 value. 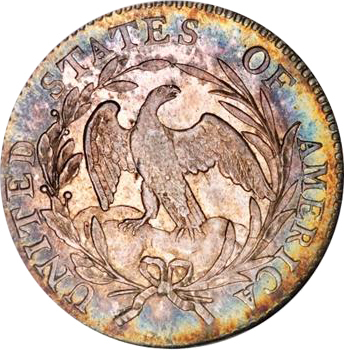 The varieties can make a huge difference in value with this series; for examples; the 1797 16 Stars is more valuable than the 13 Stars, the 1798/97 13 Stars is more valuable than the 16 Stars, the 1798 Small 8 is more valuable than the Large 8, but the 1804 13 and 14 Star and the 1805 4 and 5 Berries varieties don’t make much difference in Draped Bust Dime value. Draped Bust Dime Value is effected by the date, condition, grade and variety.